Growing up, Wesley never knew his father. When he was 15 years old, Wesley and his brother were taken away from their mother because of abuse and neglect. They were moved around to many different foster homes, and as a result, Wesley fell behind a lot in school. This caused Wesley to draw back socially and become apathetic on the outside. When the two brothers were brought to Place of Hope, they moved into a Family Cottage and were matched up with mentors. Wesley’s mentor spent a lot of time with him and began instilling messages of hope into Wesley’s life. Slowly, Wesley’s grades started improving and his attitude was improving through playing on his school’s football team. 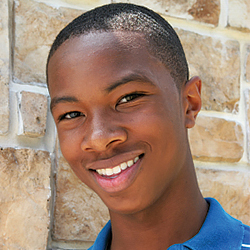 When Wesley turned 18, his mentor invited him to move into his house to live with the mentor’s family. Wesley was so happy! The transformation that Wesley went through at Place of Hope was tremendous, and we are so thankful that because someone chose him, he continues to build a better future for himself today.